My mother has become known within our little family circle as the queen of chicken fajitas. No, she hasn’t developed any crazy recipe over the years. There are no special ingredients to speak of. In fact, I believe the recipe for the chicken is out of a generic cookbook called “365 Way To Cook Chicken”. It is, however, delicious in every way possible. I’m a sucker for Mexican food anyway, but I guess you can call it a case of nostalgic perfection in the eyes of our family. Fajitas have always been there, in the good time and the bad. No matter what the circumstances brought in life (and there were some real doozies, believe me), fajitas somehow made everything better, at least for the time being. When my mom told me that she was making her fajitas for Father’s Day dinner this past Sunday, I had a heck yea moment. She asked if I could make some salsas for some pre-game appetizer action, to which I happily obliged. 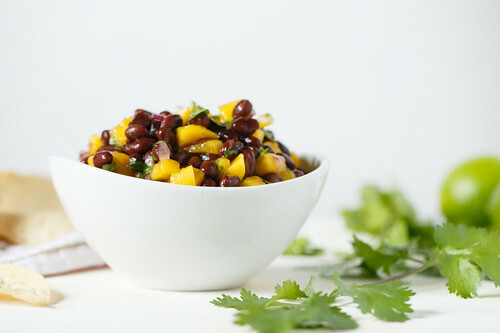 I made the Pineapple Habanero Salsa that has become a standard necessity, a Corn Poblano variety (recipe to come at some point this summer), and this Black Bean and Mango beauty. Using a ripe mango is really important here. Finding a ripe mango is comparable to shopping for peaches or avocados. You want ones that will give a bit under gentle pressure. The color of the mango really doesn’t matter (red doesn’t necessarily mean ripe). And hey, look at that cilantro! Guess who grew that cilantro? Guess. Guess! That’s right, Mr. Green Thumb right here. I see mini zucchini and squash starting to pop up in the garden too, so we’ll most likely be inundated with those soon enough. Anyone have some creative recipes for zucchini and squash? Place the finely chopped red onion in a strainer and hold in the sink under running hot water for about 1 or 2 minutes. This will take the strong “bite” out of the onions. Alternatively, place onion in a small bowl filled with ice water for about 10 minutes and then drain. 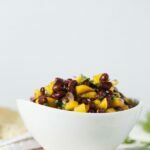 Combine the black beans, mango, onion, jalapeño, juice of 1 lime, honey, olive oil, cilantro, and a pinch of Kosher salt in a bowl. Refrigerate for at least 30 minutes to allow flavors to meld, although longer (up to several hours) is better. Before serving, stir to redistribute juices and if needed, add the juice of the other lime. Also at this point, if the jalapeño is a really hot one and the salsa is a bit too spicy, I add a little more honey to balance the heat. 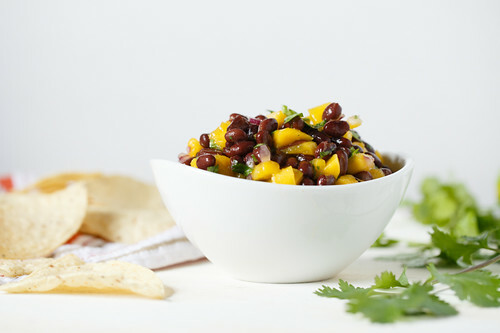 Serve with tortilla chips or use as a topping for chicken or fish. That’s awesome about your garden!!! Cilantro is one of my favorite herbs…even though my husband thinks it taste like soap. Get some of those garden pictures up…we want to see them. 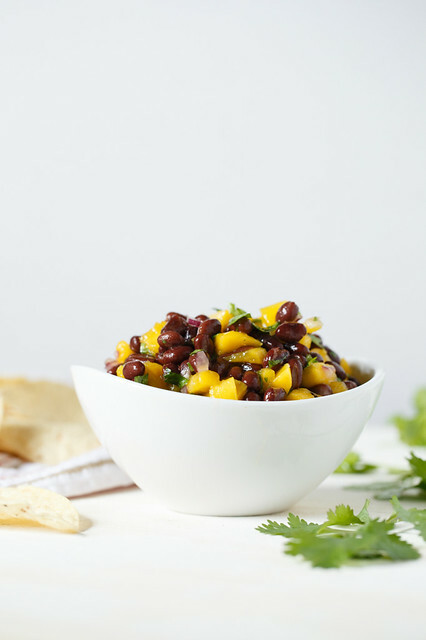 This salsa just sounds way too good not to try. I’m kinda cursed when it comes to mangoes though..got any good tips as to how to pick the right ones? Pick mangoes by how they feel. They should feel like a ripe avocado or peach.